As a career woman in a man’s world, Angelica Kauffman was not protected from gossip and tittle-tattle, envy, malevolence or scandals. 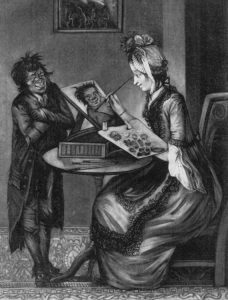 Especially in England, caricatures, satirical poems and fabricated anecdotes resulted in the image of an artist who supposedly turned men’s heads with her flirtatious manner. Some considered themselves the victims of her intrigues; others bragged about having seduced her (Ill. 46 und Ill. 47). Various caricatures showing a female portrait painter at work were levelled at Angelica Kaufman while at the same time denigrating her clientele as “macaronis” or representatives of the lower class with coloured skin. The title of a caricature appearing in 1772 alluded to Alexander Pope’s 1733–34 Essay of Man, in which discusses the necessity of preserving reference the social order. A woman artist, who violated the gender-specific distribution of functions per se, is here ridiculed as a disturbance of the old order (Ill. 48). Angelica Kauffman knew how to defend herself against these attacks quite effectively. 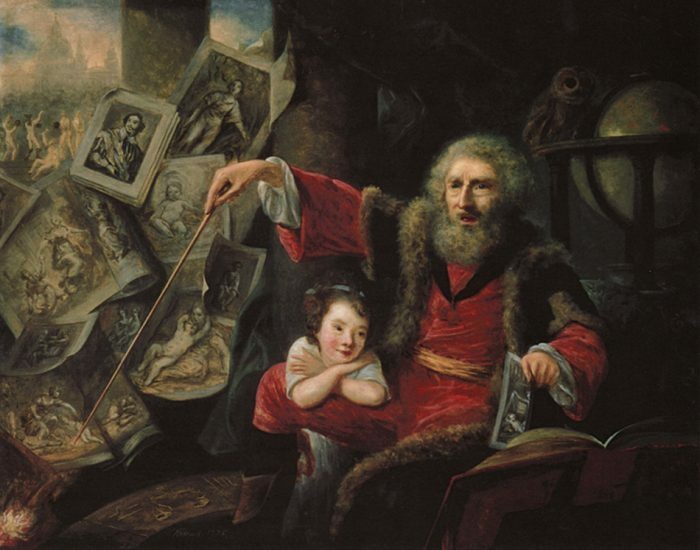 When the Irish painter Nathaniel Hone (1718–1784) showed his latest painting The Conjurer (1775) at the annual exhibition of the royal academy, he caused a scandal. The public had no trouble recognizing that, in his work, he was mocking the director of the institute as a sorcerer and his colleague Angelica Kauffman as an obedient apprentice. The real bone of contention, however, was a scene – meanwhile overpainted – at the upper left of the composition, in which Kauffman thought she recognized herself as a naked booted figure. Without further ado, she uncompromisingly and self-confidently demanded that the painting be removed from the show. The image commonly held of Angelica Kauffman today has been shaped in large part by popular literature and novelistic biographies which embellish her life story with anecdotes and speculations. The tunnel view of the biographers is directed primarily at the question of which men in her surroundings she had had love affairs with. 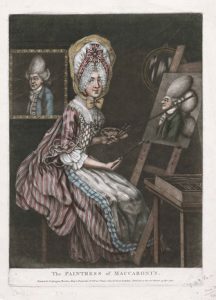 Far more attention is paid in these accounts to her ill-judged espousal to a marriage swindler in London in 1767 and the matter of whether she had a love affair with Goethe than to her artistic accomplishments. The spectrum ranges from pure fantasies about her life in novels such as the one by Léon de Waillys (1838) to the popular biographies sympathetically drawn up by Adeline Hartcup (1954), Dorothy Moulton Mayer (1972), Simona Weller (1998) or Gabrielle Alioth (2007). Her biographies avail themselves of various patterns of reception from her idealization as a successful career woman to her stylization as the sacrificial lamb of a chauvinist art scene, and even her vilification as the object of vulgar Freudian speculations as in the cases of Oscar Sandner and Siegfried Obermeier (1987, 1998).